Ecoplanet way is a company dedicated to the sale and repair of electric scooters and all types of electric mobility products in all areas. Betting on a means of transport ecological and future, easy to use, low maintenance and no pollution or noise. 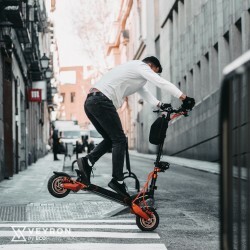 We are specialized mainly in the sale of Segway type scooter, hoverboard, monorueda, miniscooter, motorider, scooters, etc ... We have developed a wide range of products with innovative designs, designed to facilitate mobility in urban spaces.